CMU Myths & Monuments: Watch Where You Step During Finals Week | Grand Central Magazine | Your Campus. Your Story. Finals week can be a stressful time for many students at Central Michigan University. One reason to worry about finals that most may not think about? 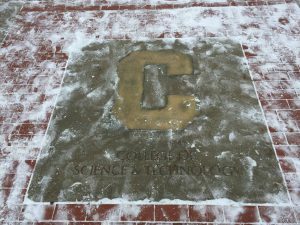 The C in between Dow Science Building and Moore Hall. Stepping on the ‘C’ near the Dow Science Building. 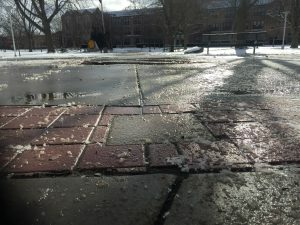 There are many myths about what could happen to those who steps on the C.
Boak, who found out about the myth his freshman year after a few older students told him to be careful of it, has intentionally stepped on the C multiple times. 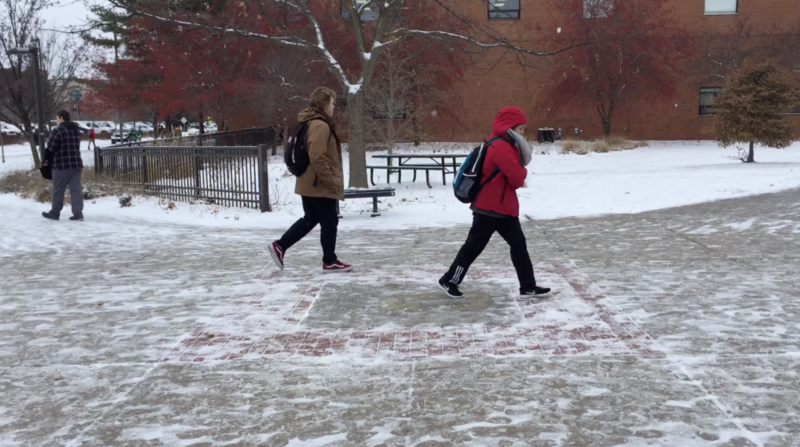 Other students like CMU senior Anna Macdougall majoring in biomedical science won’t even risk getting bad luck by stepping on the C.
The Greek Circle outside of Grawn Hall. Whether this superstition is true or not, it’s certainly true that finals week can be a source of stress and worry for CMU students as the semester comes to a close. Can you tell who stepped on the C and who avoided it? Separator image Posted in Campus Life, Student Lifestyle and tagged with Brittany Andrade, Central Michigan University, cmu, CMU Myths, myths. What Netflix Show Describes Your End of the Semester?